I don’t have any money-making millionaire ideas up my sleeves but what I do know is that when free money is offered, I’ll take it provided it’s legal. The other day while visiting work with our son the conversation of money came up and how much it costs to raise a child. Although there is no concrete number since it depends on many factors including if you buy high-end stuff, too much stuff or are frugal with your cash. That’s only a few reasons of watching your budget grow when you have a child but we also got on the topic of pensions and RESP’s. One co-worker said he wouldn’t bother investing in an RESP if he had a child as he was going to save the money himself nor did he participate in the works pension plan. I was surprised considering how much it costs for him to get his University education however we don’t know if his education was paid in full by his parents or someone else. I know since I had to work to pay for my education I wouldn’t miss out on free money from the government for my son’s education. Even the brightest of people are mushy when it comes to money management and their own finances. I know many of you would be scratching your heads wondering why he’d give up free money but it happens all the time. I haven’t met many people who ‘love’ their job and would stay working even if they won the lottery nor do I know anyone who would pass up the opportunity to make money for free until now. 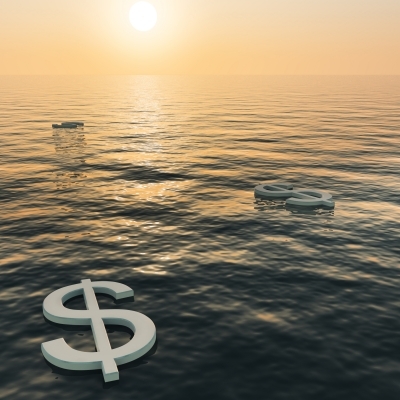 It’s not uncommon for employers today to offer a pension plan of sorts for their employees. Not everyone has a defined pension plan but what many people might have is a plan where the employer matches the contribution made by the employee up to a certain percent. It means free money that some people might shrug off because it’s not free money that you get in your hot hands now rather it’s for the future. Employer contribution plans mean you potentially are being handed thousands of dollars of free money provided you participate in the program and keep working for your employer in order to build your portfolio. Often we will see people not participate in employer pension matching programs because they are not informed enough about the program so it’s nice when the employer brings in the professionals to explain the ins and outs of pensions and how it will benefit the employee in the future. You may be invited to participate in a session with a financial advisor who will go through the pension matching program that has been put together for the employees by the employer and have an opportunity to ask those burning questions that you want answers to. Another reason might be the employee simply has no money to give. The money may already be spent before he or she gets the pay cheque. If the extra $50 each pay goes towards a pension matching plan that the employee can’t afford that might mean less money for groceries or bills that go unpaid. I used to belong to a works pension scheme at my old job in the UK and the employer matched up to 6% so it made a 12% contribution into my pension. Within only 2 years of being in the scheme I had a sum of approximately $15,000 which I thought was fantastic considering I had only put in half of that. You could think of the payments that the company pays in as a pay rise, except you don’t get to enjoy it just yet. Keep in mind though that it’s never too late to join as Mary who wrote a compelling post at The Brighter Life in 2012 about how much free money she lost by not contributing to her employers pension matching program. When you see the huge number and it is huge $372,000 over a 20 year period (which includes interest) it might encourage you to find a way to make extra money to help you participate in your employer pension matching program. So, when a young employee who is just learning the ropes told me that it wasn’t worth his time nor money to invest in his retirement when it was so far away I have to disagree with him. I hope he gets the education he needs or hopefully what I told him might encourage him to start participating in getting his free money now rather than waking up to the fact years down the road like Mary has. Sometimes the need to make money is not only in the present but in the future but if you don’t think ahead it’s near impossible to plan your next steps but remember it’s never too late to put money away for down the road. Do you participate in your employers pension matching plan? We are always looking for ways how to increase our savings and retirement investments. 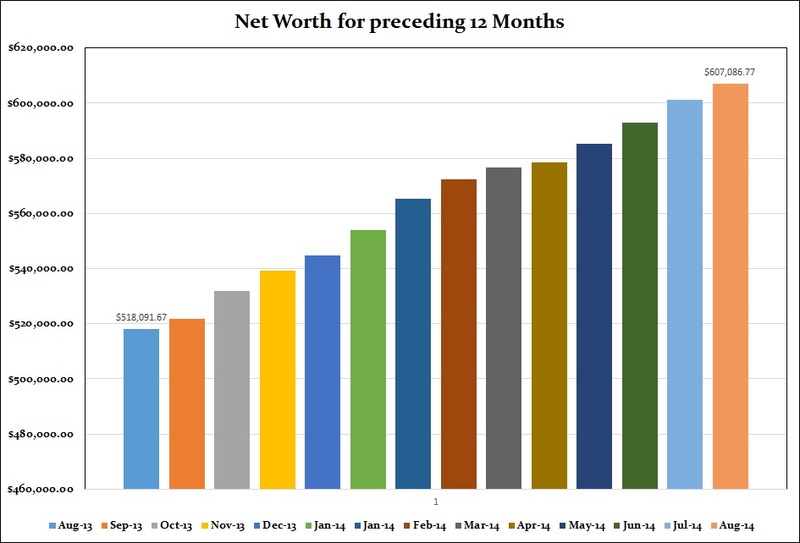 By tracking our net worth these numbers below show us how well we are doing in terms of meeting our target numbers or what areas we should concentrate more on. 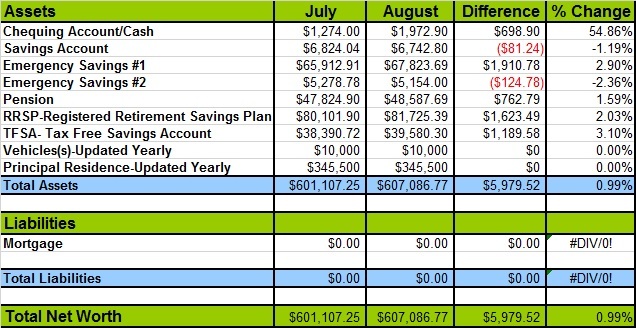 You can check out our August Budget Update to see where the money went in our budget to give you a bit more information. In August our net worth didn’t change significantly, but still posted an increase in value. The investments made a gain and we took a very minor hit on the remainder of funds still in the UK due to the fluctuating exchange rate. Overall our Net Worth rose just shy of 1%. I find it’s much easier to be held accountable when I share what we need to do with all of you. Yes, my wife refers to the list when she asks what I plan to do next. I’m not sure if that’s a good thing for me or not, lol. Every month I update these mini short-term goals as I like to call them where you will see what’s new and exciting in our world but not just financially. These goals are our life goals which include everyday jobs that need to be completed. We like to carry out these goals on a monthly basis although that doesn’t always work out that way. To renovate the upstairs bathroom- Renovations started but still need to purchase products. Clean up the basement- I need to get rid of junk and have a garage sale or just give it away for free. Fix some screw holes in the baby room– I will tackle this before baby stays in room exclusively. Purchase all new kitchen appliances- So far all we have is a new stove and an extractor fan (range hood) but they are not installed. We are on the hunt for a kitchen sink, tap and pot-filler. Purchase a new freezer- We are buying one medium sized freezer and donating our large freezer. August update: not much has happened as the bathroom reno took over my time. Finish the landscaping in the front and back yards- I am now bringing in the outdoor furniture and trashing the hanging baskets for the year. Almost done. Invest more in our TFSA, RRSP etc. – We will be setting up baby’s RESP and looking to top up my TFSA. To grow more vegetables/herbs in the garden- Our fig tree is fully loaded with figs and we managed to get 3 limes from our lime tree which smell amazing. I’ve never smelled a lime straight from the tree but does it ever smell fragrant. I’ve now brought the fig tree indoors for the winter but in full sunlight. Learn more about passive income- I’ve been reading about earning extra income on the blog but to be honest I’ve been focusing more on my new career which is more important to me. To read a new personal finance book- Let’s be honest and say I might be lucky to read a chapter from now until the end of the year unless I find some quiet time. I wish I had more time to read books as I enjoy reading. Learn more about Search Engine Optimization and blogging and how to manage my blog- I’ve learned quite a bit about SEO and can confidently say that I can see the results of my efforts on the blog. There is always something new to learn though so never stop educating yourself as a blogger. I will do a yearly update on these goals so you know how we made out with them. The long-term goals are goals spread out over the year(s) as we are not in a huge rush to accomplish them but they are always on the top of our mind. You can also follow our monthly budget update to find out how we made out with some other short-term goals we’ve been working on. Finish remodel of the entire kitchen- This may or may not get done this year with all the new surprises that have popped up but we are still thinking about it. We know where we are buying the cabinets and have some of the appliances. Purchase a new washer and dryer- We will likely only buy a new set if we find an amazing deal but for now our second-hand units that were free are working fine. Sort out the deck lights (garbage and I’d never buy them again and not in a huge rush to fix them) Don’t ever buy those little deck lights or you will regret it, trust me. Update the garage (man cave) not really a man cave but I like to keep it neat and tidy. I’ve took some time to organize it but with the bathroom renovations there are days it looks like a bomb went off. You will notice two Jan 2014 figures and shows where we had our house valued leading to an increase in our assets. I purposely left both Jan 2014 figures in so you can see the increase visually. That’s all for this month’s Net Worth update but please check in at the beginning of October to see how we made out in August and what has happened to our finances since. Hubby had the pension plan where the company matched his deposits but we had to take money out of that to pay the bills but there is still some money there. He has officially retired from the company but the company needs to tell the company that holds his pension so we can talk to them about the best thing to do with the money. He also has a pension from back when the plant was owned by a different company and that is locked in still. Our daughter has set up a RESP for the grandson so his education should be paid for down the road. He’s a bright child(takes after his mother!!) so the money will likely come in very handy then. Her money is tight but this is a priority for her so it gets paid for. Things are looking good at your place and I hope you can get the floors done before the Little Man starts to crawl!!! When I was a teacher, I did not know if my employer contributed to my pension as far as matching goes. Looking back, I wish I would have been more diligent and looked into it at the time. I’m not one to throw away “free” money. Unfortunately, I couldn’t contribute to a RESP for my daughter as I was living on welfare and I would have been forced to cash it in, the as with any RRSPs that I had. I contribute to my work RRSP (employer matches up to 5%) and yes, I’ve seen the funds grow quite a bit. I’m hoping that by the time that I need them, that there’s still some help from the CPP plan (or even OAS). I’m going to have to look at what my “Net Worth” really is but I’m actually scared because I think it’s probably in the hole 🙁 but it can only go up from there…..